Knapp Point, Knapp Landing, and Knapp, Vancouver, Washington"
Click image to enlarge Columbia River near Knapp Landing, Vancouver, Washington. View looking downstream. 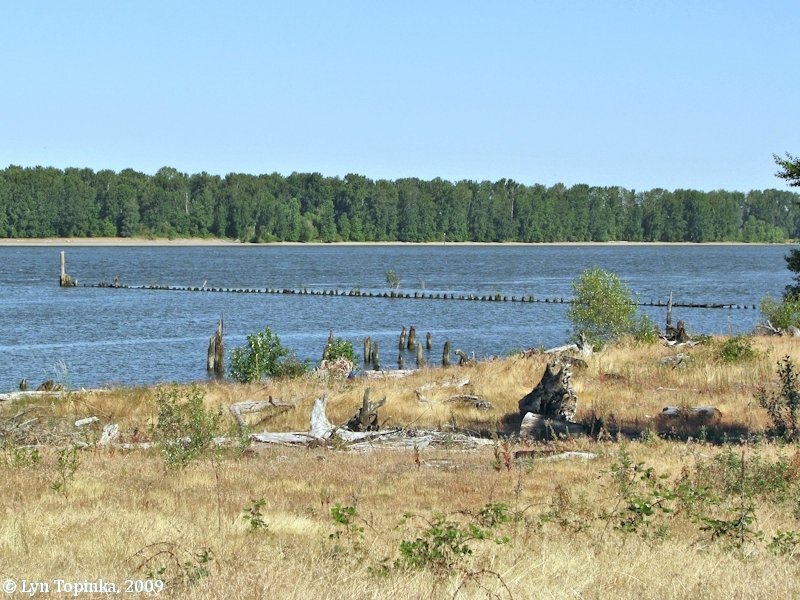 Sauvie Island is on the opposite shore of the Columbia. Image taken July 1, 2009. Knapp Point and Knapp Landing are located on the Washington side of the Columbia River at River Mile (RM) 95 and RM 95.5, respectively, in an area known as Vancouver Lake Lowlands. Upstream (south) of Knapp Point and Knapp Landing is Caterpillar Island and the Shillapoo Wildlife Area. Downstream (north) of Knapp Point and Knapp Landing is Fales Landing, and the Ridgefield National Wildlife Refuge. 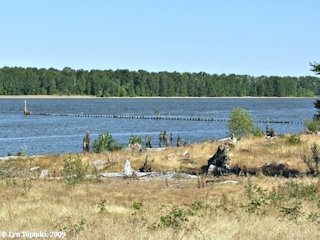 Due east is Post Office Lake and west, across the Columbia on the Oregon side are the Willow Bar Islands, on the eastern side of Sauvie Island. 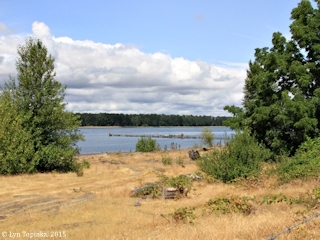 A small community of Knapp lies east of Knapp Point and Knapp Landing, on the ridge above Green Lake and Lake River, at approximate Columbia River Mile (RM) 95.5. "... Knapp: Railroad station 7 miles north of Vancouver and 1 mile east of Columbia River, west centeral Clark County. 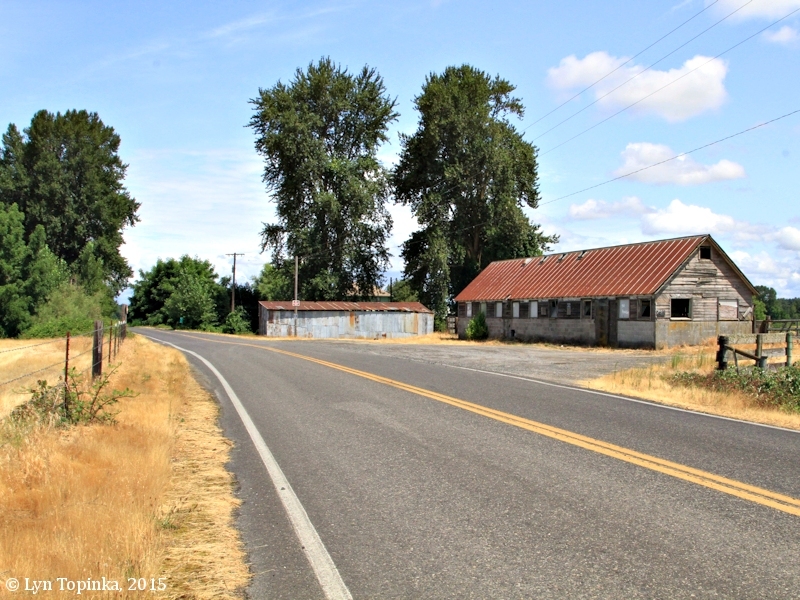 When a station was established here in 1908, Northern Pacific Railway officials named it for a local farmer from whom the railway secured property for a right-of-way. ..."
The 1913 Washington Geological Survey's "Bulletin No.17, A Geographic Dictionary of Washington" lists "Knapp. A station on the N.P. Ry., 9 miles north of Vancouver, in western Clarke County; elevation 61 feet." The 1863 cadastral survey (tax survey) shows J.B. Knapp owning 169.83 acres of the south and southwest of T3N R1W, Section 12. 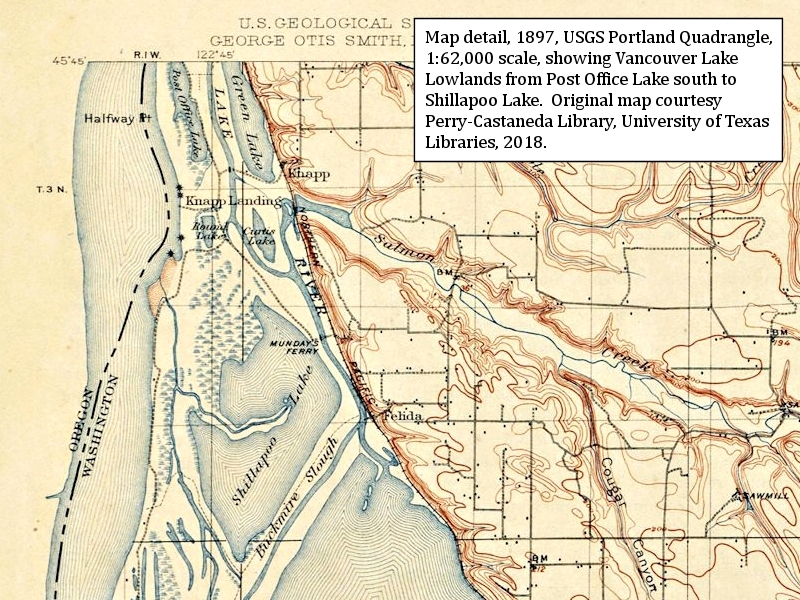 Compared to a modern map this claim borders the Columbia River just above the location known as Knapp Point and includes part of today's Post Office Lake. The location of what would become Knapp Landing lies to the south within the claim of John Dillon. The names "Knapp Point" and "Knapp Landing" are not shown on the map. The U.S. Bureau of Land Management's General Land Office (GLO) Records website (2012) shows Jabez B. Knapp being granted title to 169.83 acres of T3N R1W Section 12 on May 5, 1877 (1850 Oregon-Donation Act). 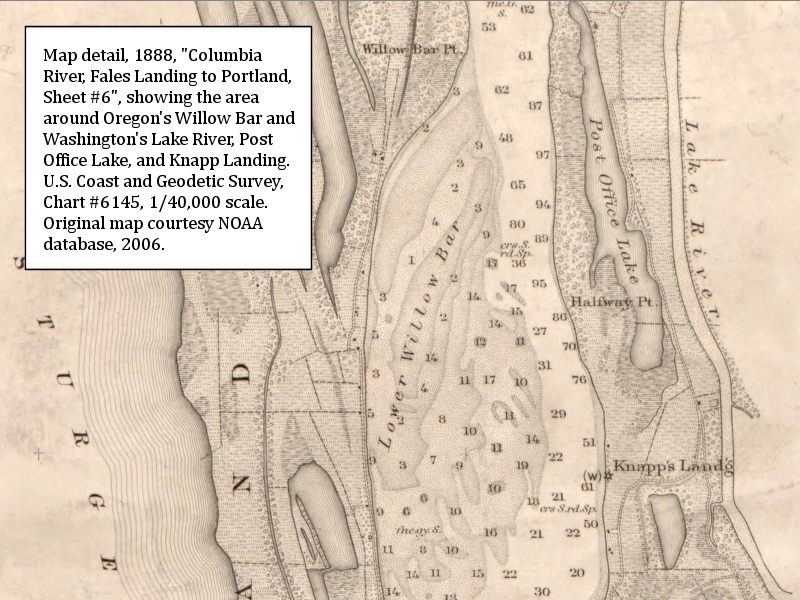 An 1888 U.S. Coast and Geodetic Survey Map (Columbia River, Sheet No.6, Fales Landing to Portland) shows "Halfway Pt." being located at the location of today's Knapp Point, while "Knapp Landg" is located slightly south. In December 1891 the U.S. Board of Geographic Names made "Knapp Landing" the official name (over "Knapp's Landing") and in January 1918 the U.S. Board of Geographic Names made "Knapp Point" official. 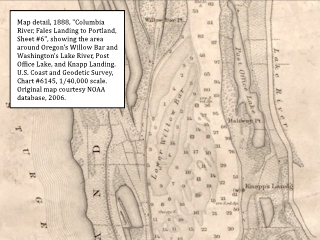 Click image to enlarge 1888, Map detail, Oregon's Willow Bar, Washington's Lake River, Post Office Lake, and Knapp Landing, Vancouver Lake Lowlands, Vancouver, Washington. U.S. Coast and Geodetic Survey's Chart #6145, "Columbia River, Fales Landing to Portland, Sheet #6", 1888. Includes "Lower Willow Bar", "Lake River, "Post Office Lake", "Halfway Pt." and "Knapp's Landg.". 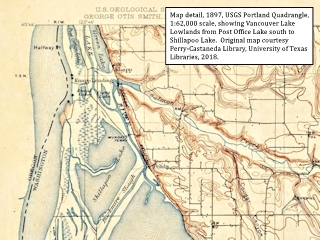 Click image to enlarge 1897 Topographic Map detail showing Vancouver Lake Lowlands from Post Office Lake to Shillapoo Lake. U.S. Geological Survey's "Portland Quadrangle", 1:62,000 scale, original courtesy Perry-Castaneda Library, University of Texas Libraries, 2018. Including "Halfway Pt." and "Knapp Landing.". 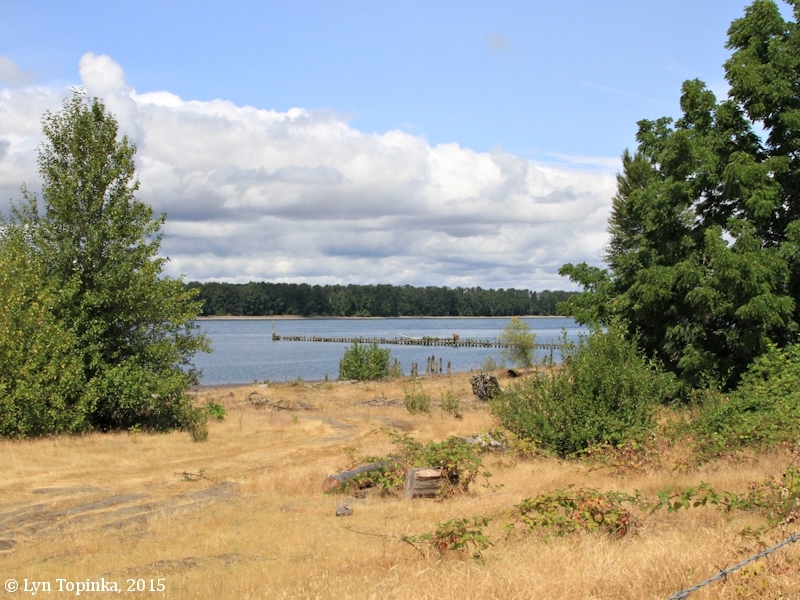 Click image to enlarge Pilings, Knapp Landing, Vancouver, Washington. Image taken July 13, 2015. Click image to enlarge Barns on Lower River Road near Knapp Landing, Vancouver, Washington. Image taken July 13, 2015. Click image to enlarge Barn, Knapp Landing, Vancouver, Washington. Image taken July 13, 2015. 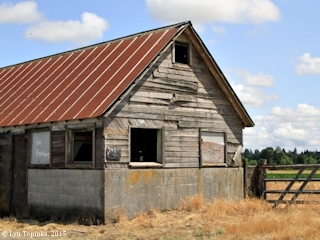 Click image to enlarge Barn, Knapp Landing, Vancouver, Washington. 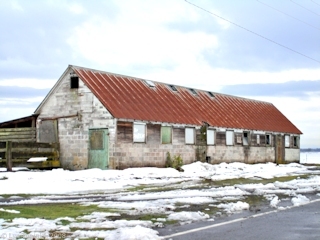 Image taken December 28, 2008. 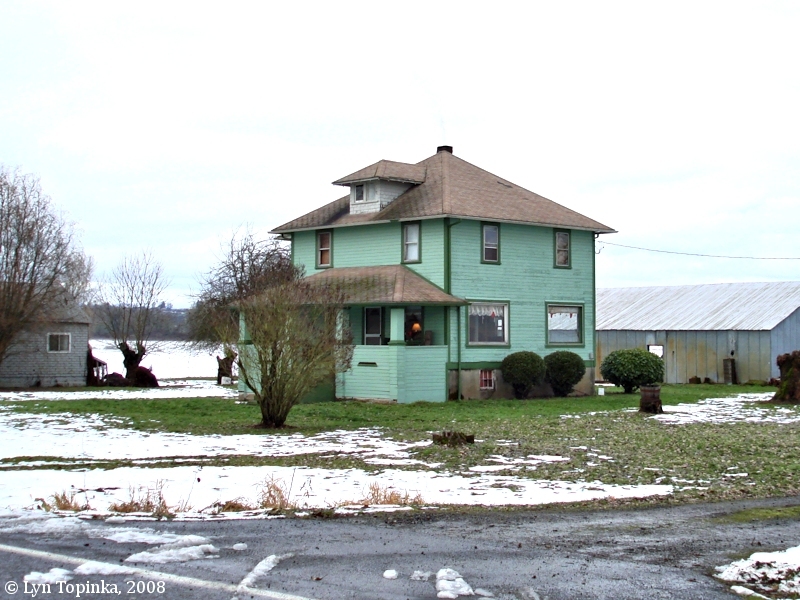 Click image to enlarge Old Fazio house, Knapp Landing, Vancouver, Washington. Image taken December 28, 2008. 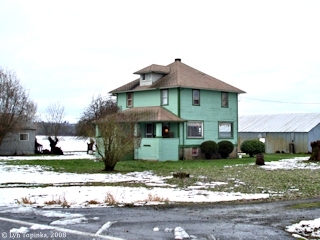 Click image to enlarge Old Fazio house, Knapp Landing, Vancouver, Washington. Image taken May 27, 2015. Click image to enlarge Osprey nest on pilings, Knapp Landing, Vancouver, Washington. 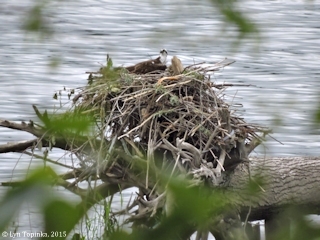 Image taken May 27, 2015. Click image to enlarge Lower River Road closure, Vancouver, Washington. 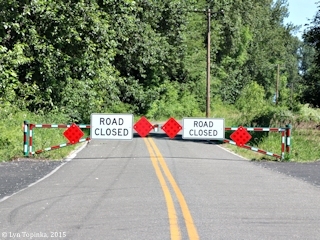 Beginning in 2015 Lower River Road closed approximately one mile before Knapp Landing, due to Columbia River erosion of the banks along the road. 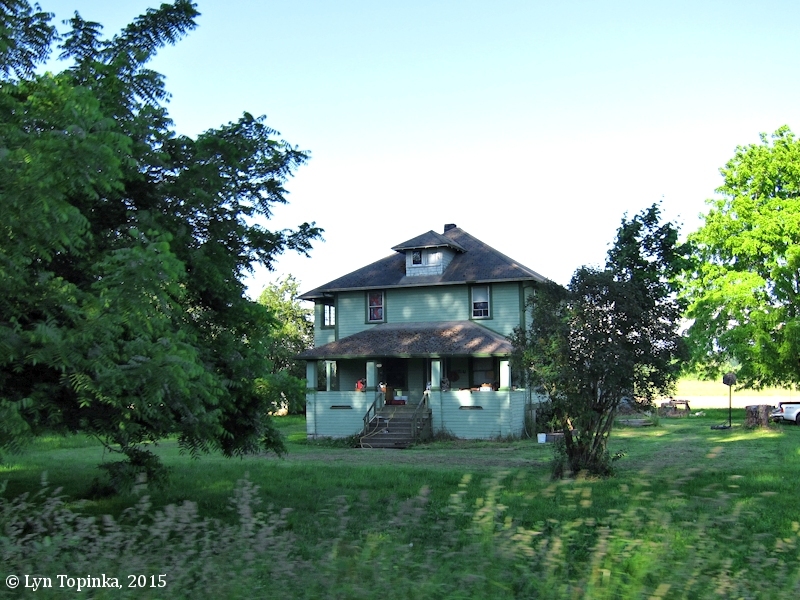 Image taken June 6, 2015. According to the 1895 ""Lights and Fog Signals of the United States" (1895, Government Printing Office) the Knapp Landing Post Light was a fixed white lantern on a while gallows frame, located on the lower end of Willow Bar, Washington. It was established in 1888 "to mark the turn to pass through the channel over the St. Helens Bar". Mount Coffin stone crusher post light will be discontinued, and a red light established on the wharf at Slaughter, Wash.
Hunter post light will be moved down stream about one-quarter of a mile. Knapp Landing post light will be moved down stream a short distance and placed on the front range beacon and a light established on the rear range beacon to form a range in the crossing from Knapp's Landing to Reeder's Landing. Source: "Sunday Oregonian", November 3, 1901, courtesy Historic Oregon Newspaper Archives, University of Oregon Libraries, 2018.